<p><b>Voted Seattle's #1 Bartending School!</b></p> <p>Price includes all registration fees, tuition, books and state-required Class 12 Mandatory Alcohol Server Training Certificate. Our graduates are making between $18.50 &amp; $30.00 per hour in Washington. </p> <p>ABC Bartending School is the largest privately owned bartending school system in the United States. 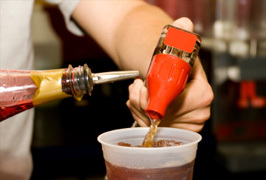 We are located conveniently off the freeway, only 20 minutes from Tacoma.</p> If you are 21 years old or older, you could become a professional mixologist with just 40 hours of training! Tony Sylvester has been placing bartenders nationally since 1977 and brings to his schools the art of matching the right face to the right place. Take a look at this job placement list for the Seattle, WA area, and the nationwide chains that have hired our students.